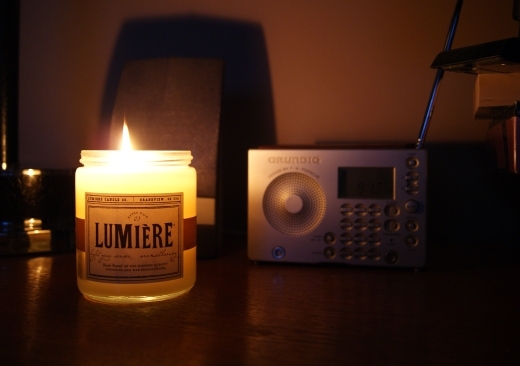 Clicking the image will take you to Lumière’s website for this candle. In their words: “a warm blanket by the fire, skin on skin.” They aren’t lying, either. I broke out Myron’s Grundig radio and brought it to the room to keep me company while I dealt with a procrastinator’s tower of paper by the light of the little fragrant candle. I heard a reporter mention the six thousand of us without power, heard the power company’s firm insistence that they were on the job, that electricity would be restored as soon as possible. As the woody-vanilla aroma unfurled throughout the room, I thought about the candles I have all over this house. I don’t light them as often as I should. There’s something inside me that wants to save them for something special. It was pretty special to put so much paper into the recycling basket. It was pretty special to breathe in that scent, to read by candlelight. (The wick almost never flickered, either.) It was special to spend time tweaking the camera until I could get the label in focus without losing the ability to read the brand name on the radio. I’ve put the lid back on that jar, because the next time I burn it, I’ll remember this day. And in the meantime, I’ll start setting some of my other wicks to blacking. I’m not really sure what I’m saving those candles for, anyway. Life is pretty special all by itself.